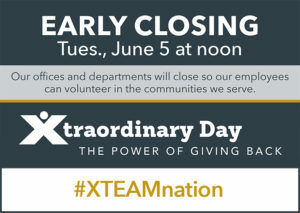 On Tuesday, June 5, 2018, Berkshire Bank is participating in their Xtraordinary Day. All Berkshire Bank offices are closing at noon so their employees can spend the rest of the day volunteering in the communities they serve. We are excited to be a part of this day of giving! To learn more about Xtraordinary Day, visit www.berkshirebank.com, like Berkshire Bank on Facebook @Berkshire Bank, follow them on Twitter @BerkshireBank or like them on Instagram @berkshirebank.